Betvictor is one of the best-known names in the online casino and sports betting industry. The online gaming site was established back in 2000 and has progressed and improved with the times. 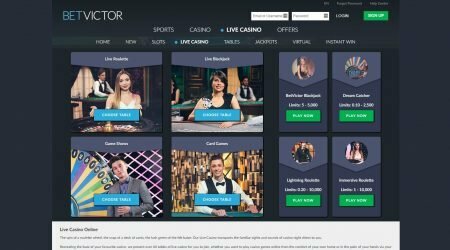 The site is powered by a wide variety of software providers which gives it an edge over much of its competition, allowing it to offer a comprehensive range of games, live casino and sports betting options to its players. The site is fully licensed and secure thanks to it being regulated by both Gibraltar and the UK Gambling Commission. These two jurisdictions ensure that the gaming site follows strict rules and regulations keeping everyone, including the players and casino, safe from fraudulent practices. This licensing, however, does mean that some countries are not eligible to play at the site. Most notably, United States citizens are unable to enjoy the fun of Betvictor. The site itself is excellently designed and well put together. It is predominantly black, which gives it a classy and elegant vibe. The font is clean, and the interface is uncluttered so that all aspects of the site are easy to read and to navigate. The site has a mobile optimised version that follows the same layout, making it very user-friendly no matter which platform you decide to play on. As with all online casinos, Betvictor offers a number of different bonuses to its players. This is in an effort to stand out from the rest and keep players happy and coming back time and again to grab a fun bonus. These bonuses also give players a leg-up to those much-desired winnings. 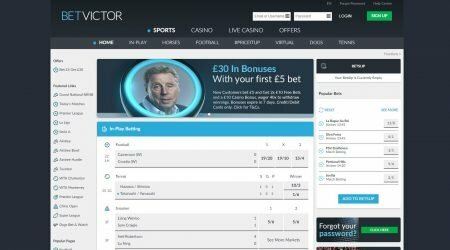 Betvictor offers a nice welcome bonus in the form of a match deposit bonus. Players will need to register for an account and then choose to opt-in at the offers selection screen. To qualify for the bonus, players must make a minimum deposit of £10 and wager this on any game except for Blood Suckers or any baccarat game. Doing so will earn the player up to £50 in bonuses which is spread across different games – a full breakdown is given. Once the bonus has been awarded, there are various wagering requirements in place that must be adhered to. For the slots bonus and instant win bonus, there is a 35x wagering requirement, while the table games and live casino bonus are both set at a 60x wagering requirement. If the player holds more than one bonus, each bonus must be fulfilled one at a time before the next bonus can come into play. Failure to complete the wagering requirements means that bonus winnings cannot be withdrawn. Across the site there are a number of other bonus offers, these depend on which part of the site you are accessing. In the sports betting section, there are a number of bonus bet options all with competitive odds available. In some sports, the bonus bet money options are available with a £5 bet garnering as much as £30 in betting options. Playing on the horses can be rewarding as there is an automatic cash refund if the horse loses all chances of winning at the very beginning of the race. Finally, there is a game of the week bonus where specific games will be highlighted. Playing on the game of the week gives players the chance to scoop part of a £5000 prize. The main casino has a large number of game options available. This is because the casino utilises games from great game developers such as Microgaming, NetEnt, Thunderkick, Novoline, IGT and many more. As with most casinos, the biggest selection is the slots. Games are available in classic, video and jackpot options. Games are in convenient categories such as ‘Featured’, ‘New’ or ‘Jackpot’ making it easy to find the perfect one. Top games include Book of Dead, Starburst and Hall of Gods. The virtual table game selection is vast. Players can play a range of different blackjack, roulette and baccarat versions. These virtual games can help players get to grips with the rules before progressing on to try their hand at the live versions of these games. 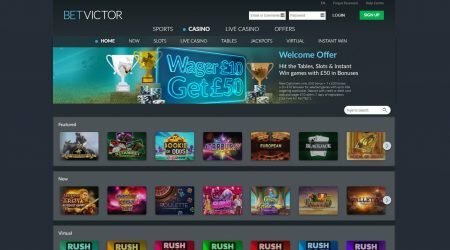 If these games get a bit much, Betvictor casino also has a large number of instant win games that can result in quick, and huge, winnings if the player is having a lucky day. The last section of the casino is the live dealer games. Here, players can find a variation of baccarat, blackjack and roulette games all with different dealers, rules and table limits – therefore, there’s sure to be something that suits. There are also a number of additional games such as Dream Catcher, game show games, and also a range of card games, including Three Card Poker, Texas Holdem, Caribbean Holdem and Stud poker, making this a nicely comprehensive live game selection. The sports betting section of the site is also equally comprehensive. There are a large number of sports on offer with up-to-date odds and betting options. The main sports available are horses, dog racing, football, and tennis, though all sports can be found in a scrolling menu. There are also virtual sports games on offer, specifically horse racing, which enables players to get in on the digital action. Betvictor has a range of different payment options available for both deposit and withdrawal. These include Mastercard, Neteller, PayPal, Skrill and Paysafecard just to name a few. Deposits are instant and will be credited to the player’s account so they can get playing straight away. Withdrawals, on the other hand, will take varying lengths of time as this will vary depending on the method used. E-wallet withdrawals can take as much as two days to process with cards and bank transfers taking significantly longer. A more detailed breakdown can be found by searching through the help centre. This is a rather long-winded process and could be set out a little clearer. It might be easier to contact customer service when checking out these withdrawal requirements. Customer support is one of the best at Betvictor. A little question mark in a speech bubble is found at the bottom right of each page of the website. Clicking this reveals a number of options including access to an information and help centre, an email option where files can be attached for additional clarity and a live chat function. The live chat function is available every hour of every day, so there is no time where players will be left wanting. The chat service, like the website itself, is available in a number of different languages, including English, German and Chinese. This enables more players to get top notch customer service whenever and wherever making this one of the best around. Betvictor has been around for a while and its success can be put down to its elegance and adherence to making everything easy for the customer. The fact that there are a wide number of betting and gambling options make this a great site if you’re not sure what your preferred gambling option is. A simple click on the menu bar will take you to all three main gambling sites in an instant. The site is also secure, safe and fair with regular auditing performed by a number of third-party companies. This means that players can rest easy knowing that they are getting a good deal. The range of games in the casino site is second to none and players are bound to find something that they like, no matter their preferences. In short, this is a great site to get into, and it comes with our recommendation.